Bike riders in New South Wales will be safer thanks to the NSW Government’s decision to implement a minimum distance when overtaking bicycles as part of a package of new road safety laws. The Amy Gillett Foundation welcomes the Government’s announcement today that it will commence a two year trial of the ‘metre matters’ rule that requires drivers to provide a minimum distance of one metre when overtaking a bike rider in speed zones up to 60km/h and 1.5 metres in speed zones above 60km/h. 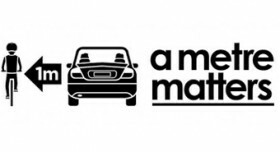 The move builds on growing support for ‘a metre matters’ around Australia with permanent laws in place in South Australia, amended road laws in Tasmania, and trials underway in Queensland and the ACT. Amy Gillett Foundation chairman Mark Textor congratulated the NSW Government on introducing the ‘a metre matters’ trial, which follows Minister for Roads, Maritime and Freight, Duncan Gay, indicating his support for minimum overtaking distance laws at the Road Safety Summit in August. “We are delighted with the Minister’s decision to introduce the trial and it caps off a breakthrough year for the Amy Gillett Foundation as we continue our mission to reduce the incidence of serious injury and death of bike riders in Australia. As the fifth jurisdiction to adopt these changes, the NSW decision puts us one step closer to achieving the Foundation’s goal of having minimum overtaking distance laws in place Australia-wide,” Mr Textor said. Amy Gillett Foundation chief executive officer Phoebe Dunn said amending the road rules in NSW to mandate a minimum overtaking distance, would make bike riding safer by changing behaviour. “The NSW community is already familiar with ‘a metre matters’ which features in the ‘It’s a two-way street’ road safety campaign, and emphasises the responsibility that both drivers and bike riders have to share the road safely, together. “The ‘It’s a two-way street’ campaign came about as a result of a long-standing partnership between the Amy Gillett Foundation and Transport NSW, so we are thrilled to see the continued commitment to a safer bike riding environment with today’s announcement,” Ms Dunn said. South Australia became the first Australian state or territory to implement permanent minimum overtaking distance rules when overtaking bicycle riders with the introduction of new laws on 25 October 2015. This followed the introduction of a two-year trial in Queensland that commenced in April 2014 and a two-year trial in the ACT which commenced on 1 November 2015. In February 2015, Tasmania introduced new road rules to increase the safety of bike riders with drivers able to straddle or cross a continuous centre line when safe to do so, in order to leave a safe space when passing a bike rider. The Tasmanian Government also outlined the safe overtaking distances for a driver when passing a bike rider as one metre at speeds of up to 60 km/h, and 1.5 metres at speeds above 60 km/h. In each case a public education campaign, supported by the Amy Gillett Foundation, has accompanied the changes. The two-year trial in NSW will commence in March 2016.